The budget deficit will total $897 billion this year — $118 billion higher than it was last year. Annual deficits will reach $1 trillion by 2022 and total $11.6 trillion over the upcoming decade. 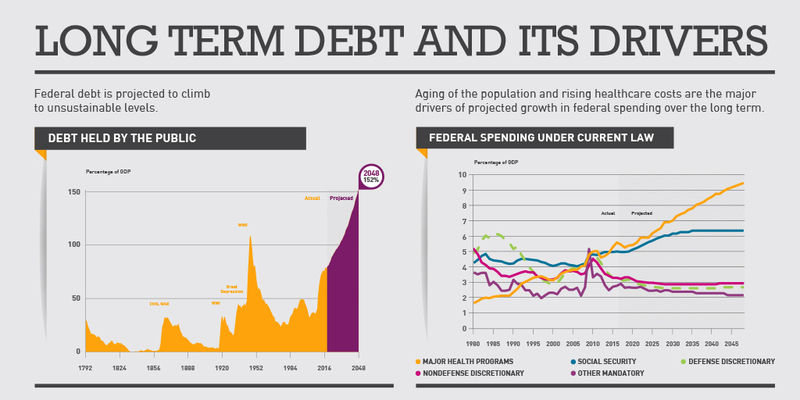 Interest costs on the debt will total $383 billion this year and will become the third largest “program” in the federal budget by 2025. The deficit is projected to average 4.4 percent of gross domestic product (GDP) over the next 10 years — very high relative to previous periods of low unemployment. The national debt will increase substantially over the next decade, reaching 93 percent of GDP in 2029, more than double the 50-year historical average. 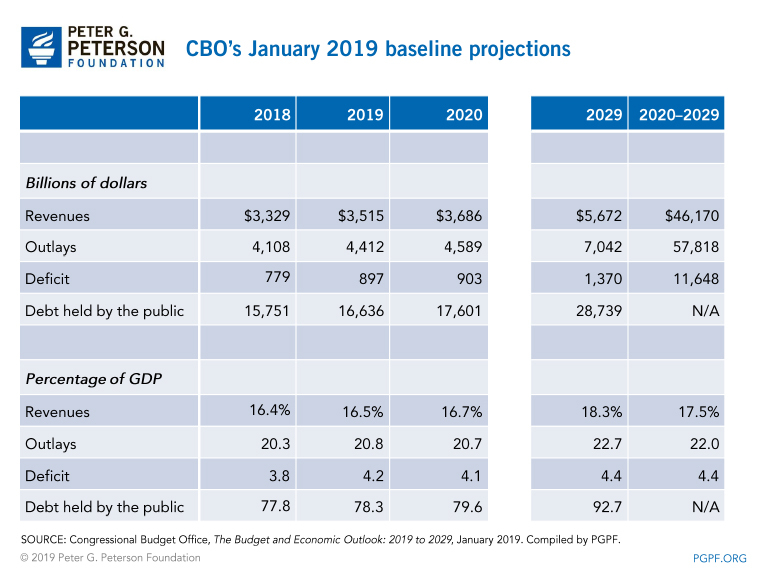 CBO’s baseline projections assume that current law will remain the same; in its Alternative Fiscal Scenario, CBO projects that deficits from 2020 through 2029 would be $3.8 trillion higher than reported in the baseline, and the debt-to-GDP ratio will reach 105 percent. CBO projects that the federal budget deficit will grow from 2019 to 2029, both in terms of dollars and relative to the size of the economy. The projected 2019 deficit is 4.2 percent of GDP and it is expected to average 4.4 percent of GDP over the next 10 years. That average is significantly higher than the average budget deficit over the last 50 years, which was 2.9 percent of GDP. Of particular concern, deficits are high during a time when the economy is strong — a very unusual pattern. The unemployment rate has been below 6 percent during 27 of the past 50 years and in those years, the average budget deficit was 1.5 percent of GDP. 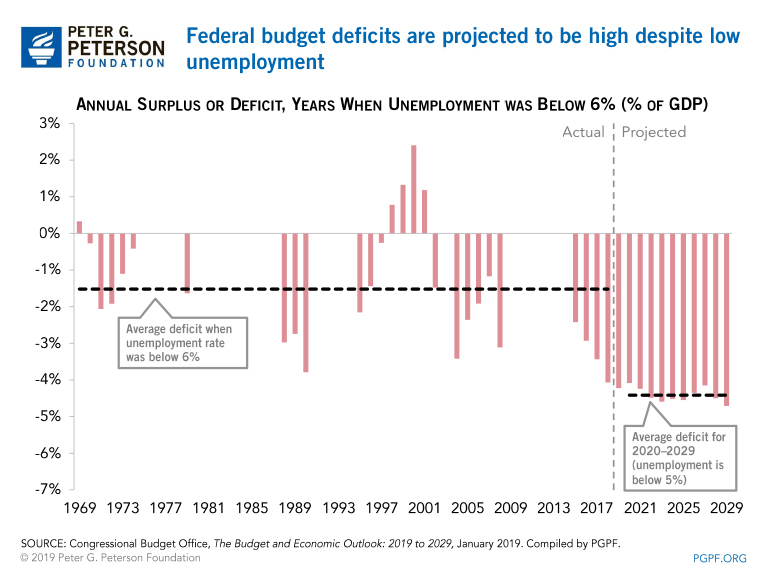 The average projected deficit for 2020 to 2029 is 3 percentage points higher than that, despite the fact that unemployment in those years will average less than 5 percent. Such high deficits during a period of low unemployment are unprecedented. 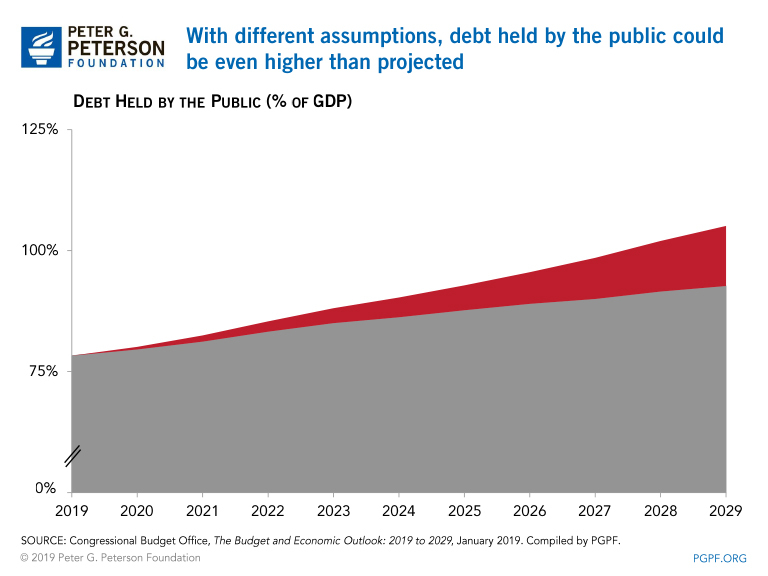 CBO projects that federal debt will reach 93 percent of GDP in 2029. Debt as a percentage of GDP has not reached that level since immediately after World War II. However, unlike that period and other instances of high debt, the budget outlook today is not being driven by temporary factors. The current trajectory is much more worrisome because projections show sustained increases in deficits and debt for the foreseeable future, fueled by ongoing structural factors such as the retirement of the baby boom generation, increases in healthcare costs, and higher interest spending — with inadequate revenues to cover such commitments. 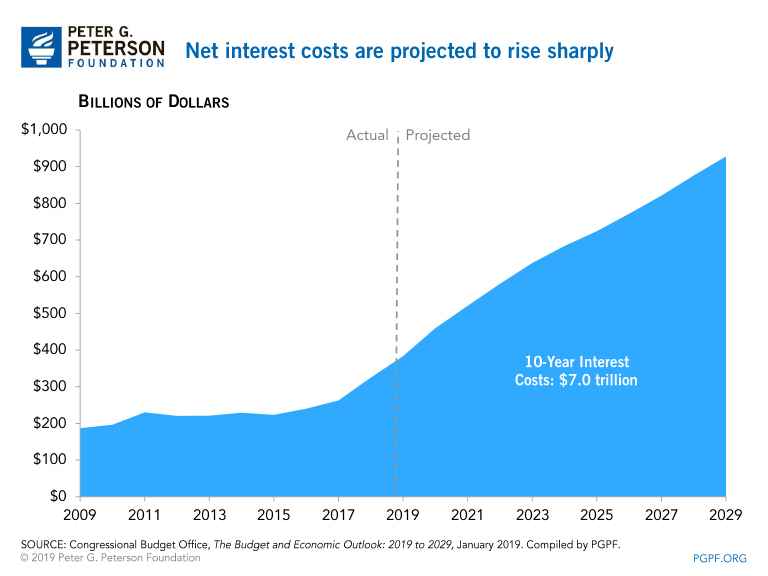 As debt accumulates and interest rates increase, net interest costs are projected to more than double over the next decade, increasing from $383 billion in 2019 to a staggering $928 billion in 2029. Increased interest costs will squeeze spending on investments such as infrastructure, research & development, and education. Major Healthcare Programs: CBO projects that net spending on the major healthcare programs will climb from 5.2 percent of GDP in 2019 to 6.8 percent in 2029. That increase is mostly attributable to growth in Medicare spending as a result of the aging of the population and rapid growth in healthcare costs. Social Security: Spending on Social Security, currently the largest federal program, will rise from 4.9 percent of GDP in 2019 to 6.0 percent in 2029, primarily as a result of the aging of the population. In 2019, federal outlays for discretionary programs will increase above 2018 levels as a result of the increase in the caps in the Bipartisan Budget Act of 2018. In 2020, however, the caps on discretionary spending are currently scheduled to decrease by 10 percent. Under this projection, combined spending for defense and non-defense purposes would decline relative to the size of the economy — from 6.3 percent of GDP in 2019 to 4.9 percent in 2029. 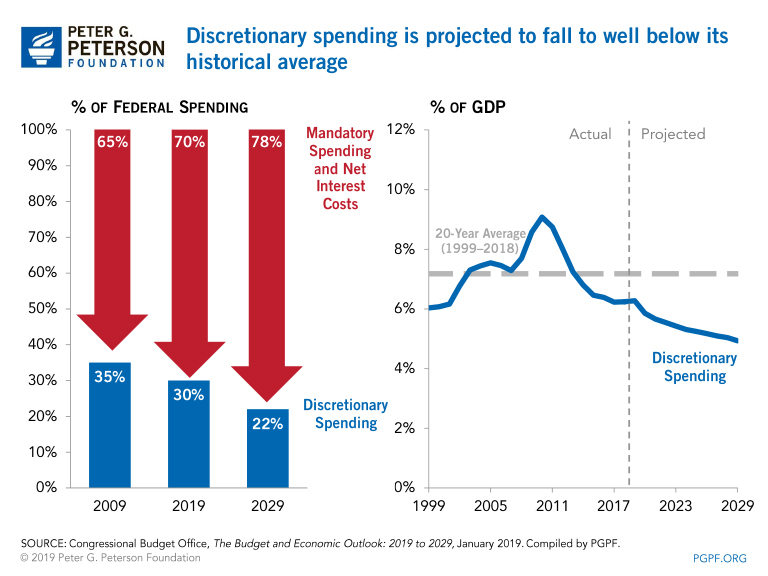 That level of discretionary spending would be lower than any recorded previously — and about one-third below its average over the past 20 years, which is 7.2 percent of GDP. The Bipartisan Budget Act of 2018 increased caps on discretionary spending for 2018 and 2019, but not for the following 2 years; CBO’s baseline incorporates the large drop in the caps for 2020 and 2021. Many of the provisions in the Tax Cuts and Jobs Act (TCJA) will expire at the end of 2025, and a number of pre-existing tax provisions are set to terminate between 2020 and 2028. In the baseline, CBO assumes that none of those provisions will be renewed. Under current law, businesses can immediately deduct (expense) 100 percent of certain kinds of investments (such as those for equipment) through 2022, with decreases in that percentage beginning in 2023. CBO’s baseline assumes no extension of the existing 100 percent expensing. A number of taxes established by the Affordable Care Act have been postponed from their original dates to various dates over the next 10 years. CBO’s baseline assumes that they will all go into effect as currently scheduled. Congress has a long history of renewing or extending such policies (and sometimes doing so retroactively after they expire). 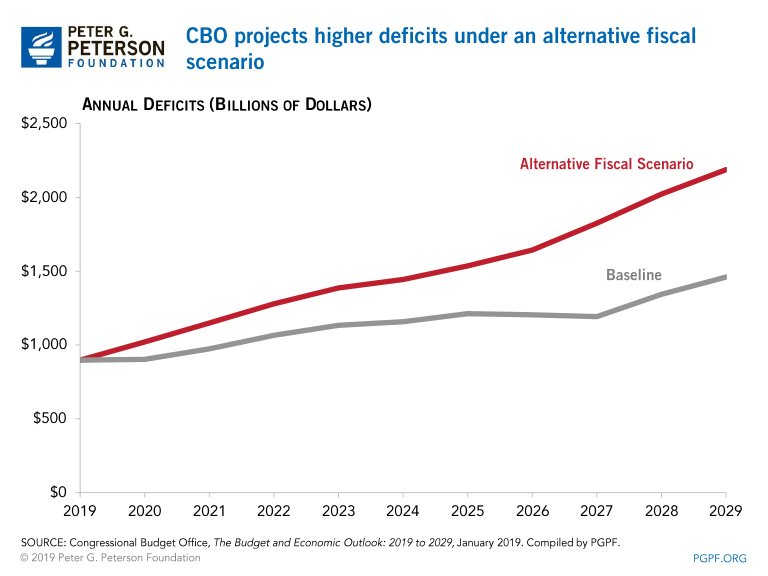 CBO’s Alternative Fiscal Scenario assumes that certain policies listed above would instead be continued. 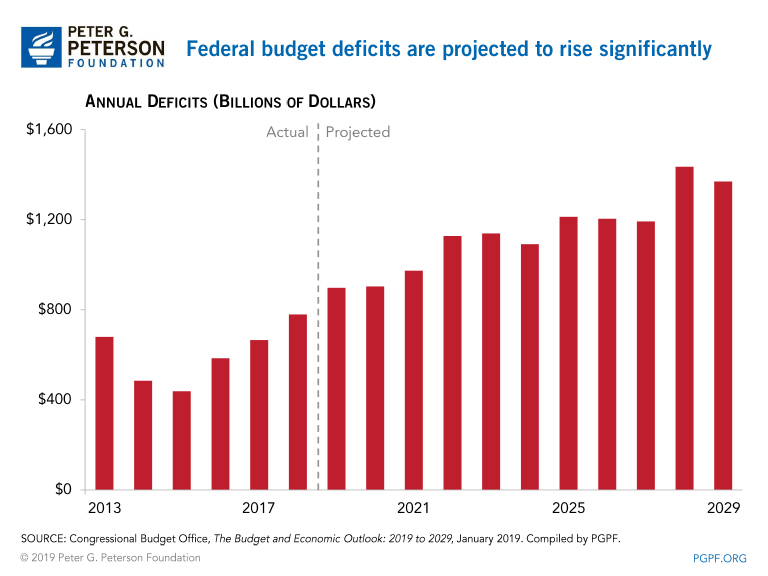 Under this scenario, CBO projects that the cumulative deficit from 2020 through 2029 would be $3.8 trillion higher than reported in the baseline and that the 2029 deficit would be around 7 percent of GDP at the end of that period. In CBO’s view, the TCJA has changed incentives to work, save, and invest, which will raise real GDP in the short term; in addition, the higher appropriations that were made as a result of the Bipartisan Budget Act of 2018 gave a boost to near-term growth. However, CBO projects that these effects will diminish over time. Business fixed investment grew by 6.8 percent during 2018; CBO projects that it will grow by just 3.2 percent in 2019. Real GDP growth is projected to fall from 3.1 percent in calendar year 2018 to 2.3 percent in 2019 and 1.7 percent in 2020. Furthermore, over the longer term, CBO projects that growth will be tempered by greater levels of debt and higher projected interest rates. Each CBO baseline projection incorporates economic and legislative developments that have occurred since the prior projection. The baseline that CBO released this week reports that the cumulative deficit for the 2019 to 2028 period (the 10-year period used in their adjusted April 2018 baseline) is $1.2 trillion lower than the $12.4 trillion they previously projected. Much of that reduction stems from the way in which emergency spending was projected in the adjusted 2018 baseline. Emergency spending for 2019 thus far totals $2 billion; in 2018, such spending totaled $108 billion. CBO’s extrapolation from the lower 2019 amount results in a large reduction in projected outlays compared with its previous outlook. That change, and others categorized as “legislative”, reduced the projected deficit for 2019 to 2028 by $774 billion, representing nearly two-thirds of the revisions relative to last year’s baseline. Changes to CBO’s economic forecast also contribute to the differences in CBO’s newest budget projections. 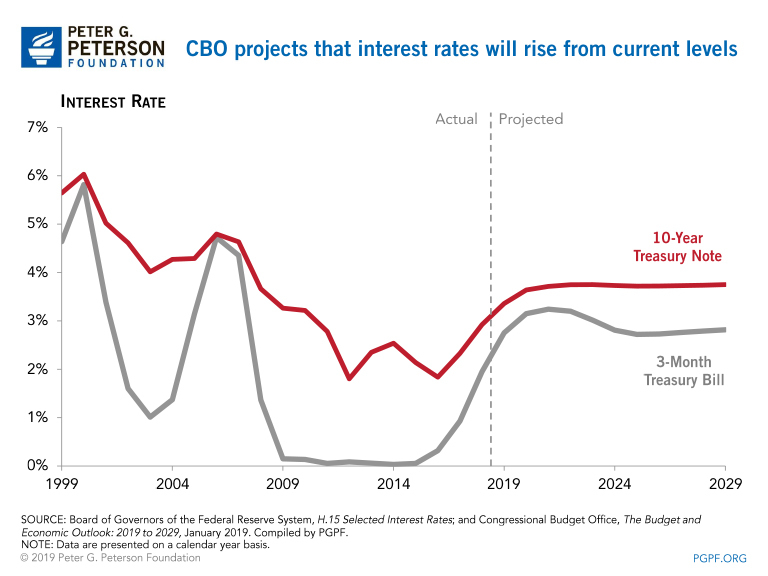 Decreased outlays for interest costs, resulting from lower projected interest rates, was the most significant revision. Those changes reduced the projected deficit for the 10-year period by $336 billion, representing 27 percent of the difference compared to last year. A number of changes labeled as “technical” reduced the projected 10-year deficit by $115 billion, the balance of the difference compared to last year. 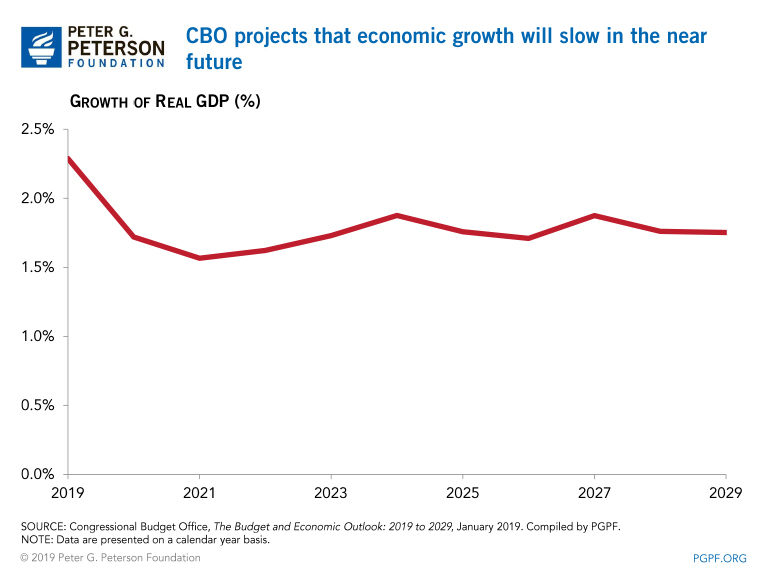 CBO’s latest projections show that the nation remains on an unsustainable and dangerous fiscal path. 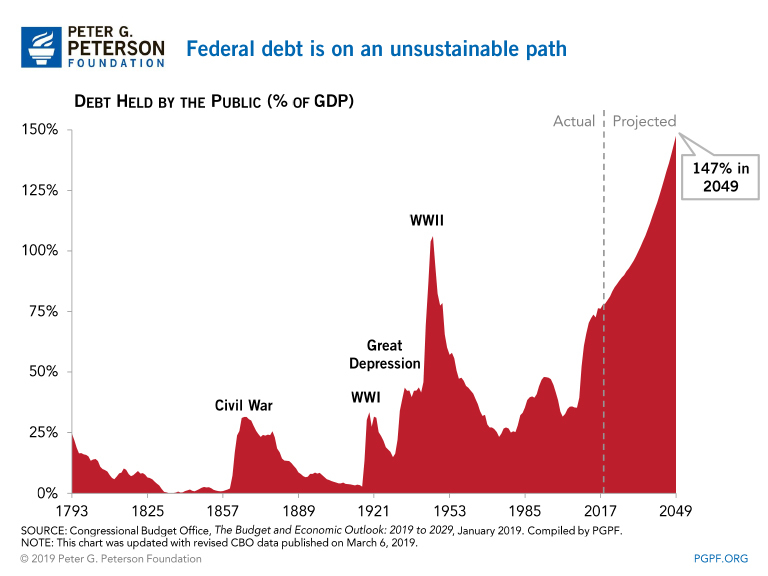 Absent actions by policymakers to implement solutions, our national debt will grow in coming years and relatively soon exceed the size of the entire economy. 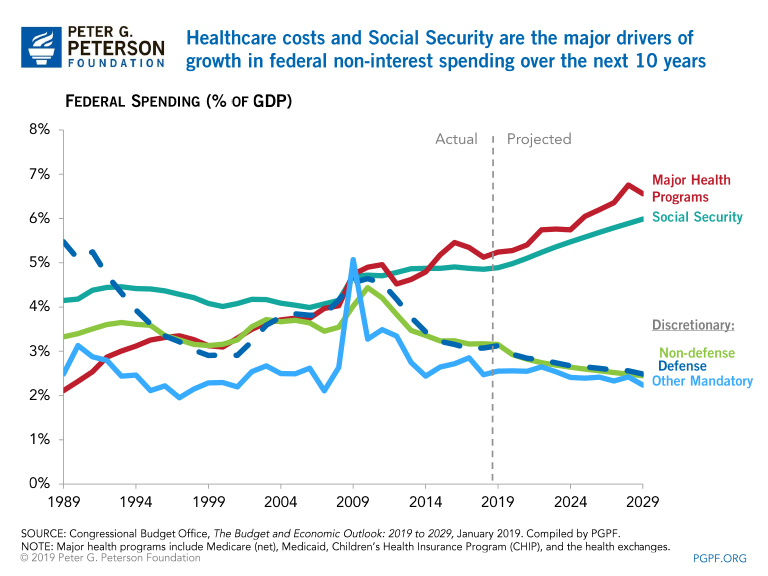 In addition, interest costs will grow rapidly and risk crowding out important national priorities. However, we have the ability to reform our budget to put the nation on a much more stable fiscal path, which will improve the future of our economy. By getting our fiscal house in order we can create the conditions that encourage economic growth, enhance business and consumer confidence, and build a prosperous future. The new Congress, in conjunction with the President, should correct past policy failures by enacting sensible reforms that put our nation on a sustainable fiscal path — and the sooner they act, the better.